I grew up when integration had been in full swing for a decade, and its effects could be seen. People were beginning to accept the concept that different colors could coincide peacefully. Except when it came to the color of our homes, that is. The architectural tradition of my corner of upstate New York was firmly planted in Federal and Greek Revival mold. The proper color for a house was white, white, white, or maybe Beige on occasion. 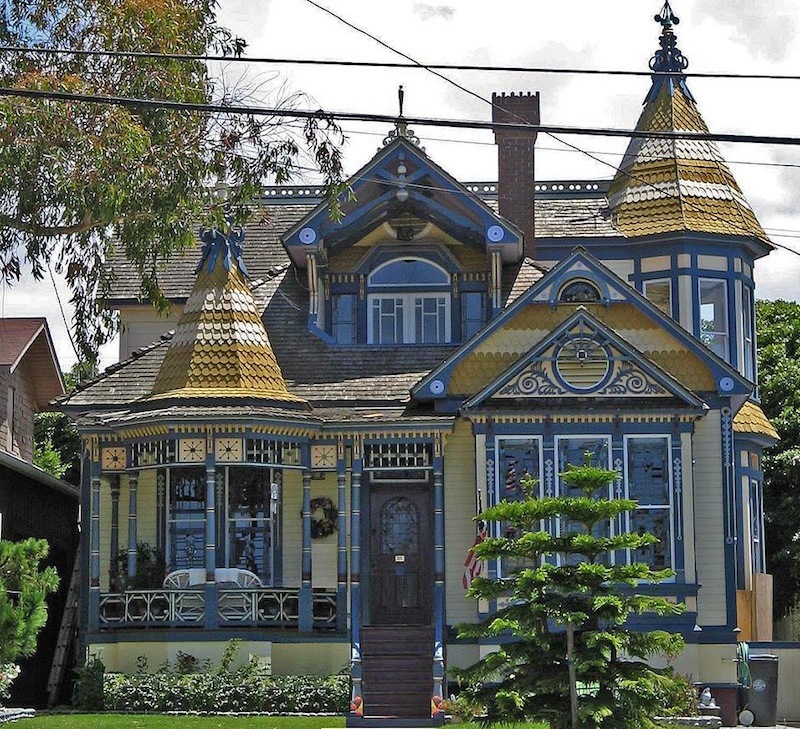 Even the trim on our Victorian homes, once gaily decorated with polychromatic color schemes, sported demure monochromatic palettes on their gingerbread. It might not have been exciting, but it was (by our standards) safe and tasteful. 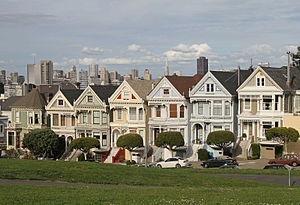 We were exposed to the mixing of different colors on homes through the media, but they seemed more appropriate for other places, like the Painted Ladies of San Francisco, with their associations to free love, LSD, and Virginia Slims. Definitely not in our backyards! Not to say everything on our homes was entirely white, many sported green or black shutters, making a strong, if not very imaginative statement. These ebony and ivory combinations might have seemed like the obvious solution to bringing different colors together, but life’s solutions should not always as simple, or as insipid, as a Paul McCartney/Stevie Wonder duet. In my defense, I could be described as white. Some might even say very white, despite my protestations of having a strain of Slavic blood. It was all I knew to mix something with, and at the time, Jersey Cream was a bit of a stretch and as much a badge of “realness’, as I could muster. Finally it was time to step outside my comfort zone. There is a whole rainbow of colors out there, in palettes of almost every imaginable hue. I thought it was finally time to mix it up a little, and the place to start would be right on my own front porch, for the whole world to see! Once having committed to a future of polychromism in a public way, I had to acknowledge that mixing colors could be a tricky process. Done correctly, a vibrant, dynamic harmonious blend is created -a celebration of difference. Done too hastily and without proper planning, you can have clashes or worse, a riot on your hands. Instead of pulling a Rodney King, plaintively hoping “Can’t we all just get along?”, I decided to adopt a more scientific approach. I would look at successful models previously employed, and learn from their example. Luckily, I didn’t have far to turn. All around me were forward thinking, artistic, and creative types, who had already mastered the integration of multiple colors on their homes. I was a bit behind the curve. This example in Red Hook, showed that the blending of colors could be tasteful and harmonious, but I wanted a bolder statement. This example, from Cherry Valley New York, was certainly bolder, but maybe something I wasn't quite ready for. The bold colors used on the trim on this house in Hudson really make you notice the brackets and the detail in the doorway, but I wanted all my details to have equal weight. This palette in Kingston I found very appealing, the colors showed of the woodwork and and the detail, but a little to after-dinner minty estrogeny to use on my own home. This house in Union Street in Hudson was getting closer to what I had in mind. The colors popped and contrasted, but all worked together instead of competing. even the smaller details were noticeable. This house in Kingston's clors did the same thing, but to a slightly more toned down effect. I decided to stay in the vein of the last two examples. The test was now to see if it wuld work. For that you wil have to wait for Part 2 when I am done painting (in about 2 weeks, fingers crossed).